Early in your Stardew Valley game you'll come across Jas and Vincent, staring into the Sewer grate in the southwest of town and wondering over its contents. Those contents, it turns out, include a small, shadowy creature with good manners and a shop... as well as a terrible history with dwarves. This is Krobus, and Krobus is one of the oddest things you'll find in Stardew Valley. Krobus lives in the Sewer, and spends his every night and day in there, seemingly alone. Krobus is polite and relatively gracious, wary of your farmer yet more than willing to provide merchanting services at any time of the day. Krobus is also the source for one of the game's rare Stardrops. You won't pay him too many visits, typically, but Krobus is important all the same. Krobus' birthday is on the 1st of Winter. Krobus likes rare stones, and you'll get his attention in particular with Diamonds - though an Iridium Bar ain't bad, either. 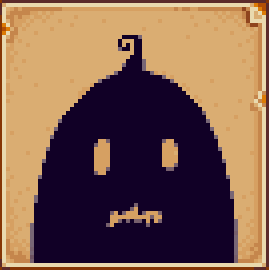 He also likes Wild Horseradish and Pumpkins, and Void Eggs go over quite well with this shadowy fellow. Krobus dislikes pretty much everything else. If you're not bringing him any of the above, you'll get either neutral responses or a polite poo-poo. He seems to particularly dislike fish, perhaps because they're the only things he gets to eat down in the Sewer. Krobus never seems to leave the Sewer, so you won't see him in any other areas. At two hearts you can catch a cut scene between Krobus, the Dwarf, and the Wizard in the Sewer. I haven't yet determined if this is trigger by Krobus, the Dwarf, the Wizard, or all three, but I had the Dwarf and Krobus at two hearts apiece, and the Wizard at ten, when it went off.